Natural to any mining boom town was the belief that one could setup shop and quickly begin to reap in the riches. As Joplin grew in size, more companies and businesses sprung up to line Main Street and other current downtown avenues. One of those businesses was the Joseph S. Baum Mercantile Company. Another was the Levin clothing store. By chance the two found themselves neighbors to the chagrin of Joseph Baum. 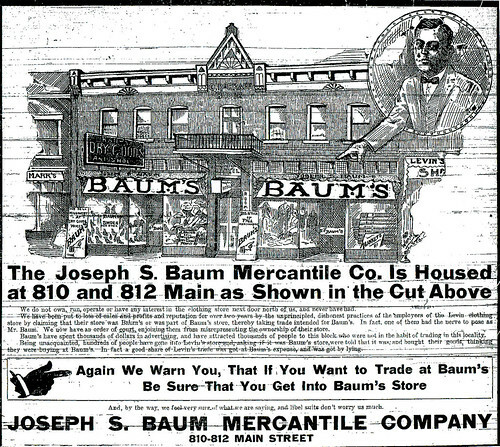 By appearances, it seems that Baum was successful and his neighbor decided to help himself to that success by holding his store out as part of his neighbors. From that point on, Baum Mercantile Company struggled through a 2 year odyssey to force their neighbor to quit their deceptive practices. The practices went so far as one employee of Levin’s pretending to be Joseph Baum, himself. In the end, it took court action to silence Levin’s employees and their deception. None the less, as a glance at the ad will attest, Baum felt it necessary to place an ad in the local paper to further clear up the issue. What’s the date on this? Joplin News Herald has a story on Baum’s new store, Jan. 1, 1908, p. 5. It appears that it was from around Jan. 19, 1913. So nearly five years later from the story you referenced. This page took 0.311 seconds of computer labor to produce.